Last month we started a new collection of posts called the Weekly Most Unmissable BIM Jobs. Although, we should have called it "monthly". This initiative is aimed to become a compilation of the best professional positions available in the AEC market for BIM profiles. It included not only the positions but also a few tips to improve your opportunities as a candidate. Now, we want to go further. Because we love BIM, we want to show you everything you can do on BIMCommunity. Whether you're looking for a job or happy with your current position, BIMCommunity can help you in so many ways. Especially for your personal branding. You might know by now that your personal branding is very important. Not only for yourself but also for your company as well. We did a very interesting seminar on this topic. You will find it available in the Technical Area section if you're already registered. If you're not, let's start from the beginning. BIMCommunity offers you a lot of tools but you have to be part of the gang first. It is free and you can register both yourself or your company. Simple, right? Well, now it gets tricky. You have to start uploading your profile. I know, it could be boring sometimes but it is your best business card or introduction. First, think about how are you going to introduce yourself to the world. Are you an architect or an engineer? What are your strengths and weaknesses? What makes you better than your competitors? Think about this before jumping to the next point: the elevator pitch. An elevator pitch is a brief synopsis of your background and professional experience. It is a way to share your expertise and skills effectively with people who don't know you. It should answer at least three questions: who are you, what do you do and what are your future plans. Writing a compelling elevator pitch is a great way to gain the confidence in front of potential clients and recruiters. 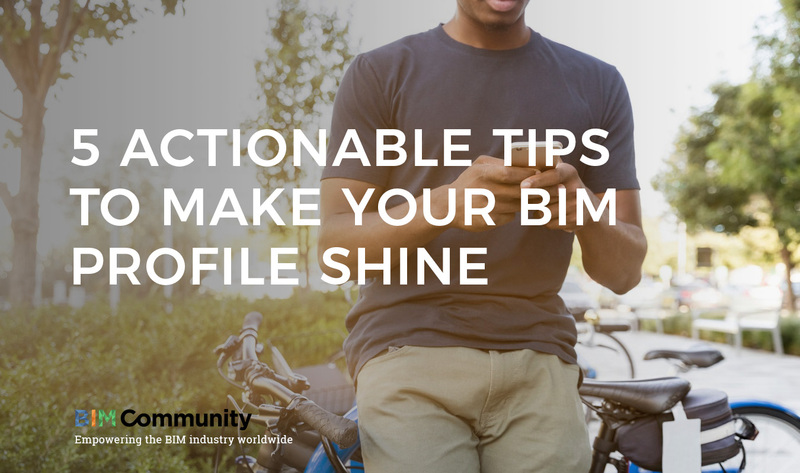 You can get inspiration from the top leaders in your field and could be useful to include it in your BIMCommunity profile, Linkedin and Twitter. 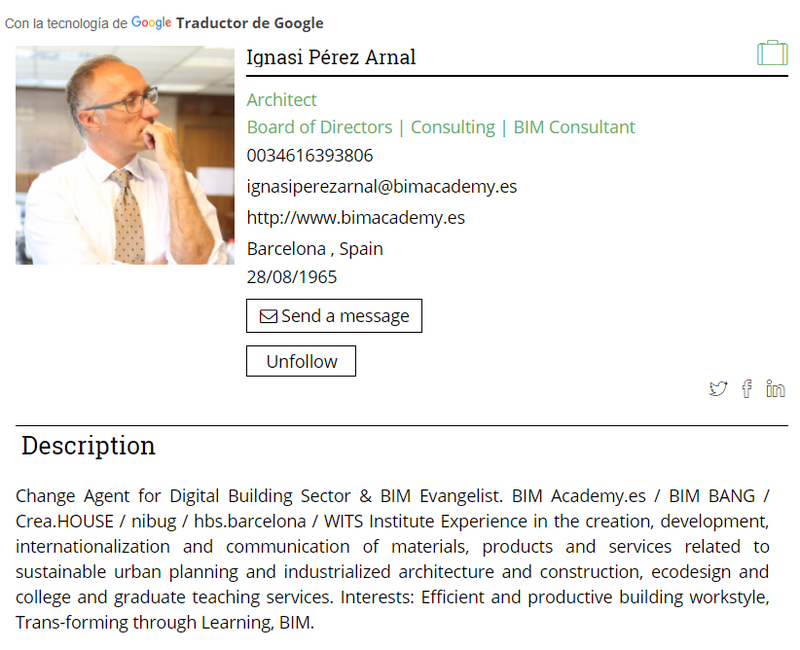 In BIMCommunity you can find your Elevator Pitch in the Description section, just below the contact information. In this case, our BIMer Ignasi Pérez Arnal has done a good job. He put all his information data plus a brief description of himself or what could it be called Elevator Pitch. He included all the relevant information to know both his area of expertise and interests. Reading Ignasi's profile would give you the perfect idea about his profile. Do your research: If you're looking for a job in Facility Management, for example, you could adapt your elevator pitch by focusing on the experience that you have in this particular field. By doing that you will be sharing your interest in the position to the recruiter and it will be easier for them to pick you in their selection. Will provide you a better networking: You can't expect to grow your network from one day to another. It is a daily effort, especially when it's human relations what we are talking about. Therefore, if you can catch your potential client's attention at first sight, it is worth working on your elevator pitch. It will make your profile shine: It is very important when you're trying to stand out among other candidates, especially in social networks. By keeping your profile updated all the time you will show the feeling that you care about every account that you have created. This tips can be applied to a personal interview or meeting too. Try to get comfortable with your speech and don't sound too arrogant, people don't usually like a know-it-all. By practicing the elevator pitch on different platforms and occasions will provide you a constant feedback and will allow you to modify the most valuable information. They say you only have one chance when you're contacting somebody you don't know for the first time so try to be both bold and accurate at the same time. Now that you have written your elevator speech it's time to jump into action. In BIMCommunity you can apply to a lot of BIM offers from different worldwide companies. BIM is growing fast within the AEC sector therefore, there has been an increasing demand for this kind of profiles. So pay attention if you're looking for a career change. We encourage professionals from the AEC sector to join BIMCommunity. Our commitment to the industry is on all levels, from local markets and regions that are making huge efforts to advance in the adoption of the BIM methodology, to a global scenario. Supporting BIM friendly initiatives and its core actors, we have developed a strong and fast-growing community, based on collaboration and real experiences from the industry. This sense of unity is only possible with BIM.